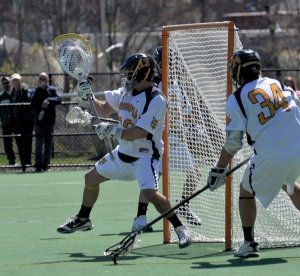 From having catches with his father and older brother, to being the goalie of a nationally-ranked high school team, Dylan Torey has shown the leadership and courage to take on anything set in front of him, especially as the starting freshman goalie for the Quinnipiac men’s lacrosse team. Torey played both hockey and lacrosse at Darien High School (Conn.). His lacrosse team was ranked third-best in the country when he was a senior last year. During his years with his high school team, Torey won two state championships and one Fairfield County Interscholastic Athletic Conference championship. Quinnipiac freshman Dylan Torey has started the team’s first nine games of the season and has logged more than 520 minutes. After he committed to Quinnipiac University during his junior year, Torey set his eyes on bringing his school its first undefeated FCIAC championship since 2008. Torey said that the recruiting process took a toll on him during his junior year, but has no regrets looking back. “The recruiting process is almost always hectic, but as I went through the journey, I have to say Quinnipiac University made my choice easy,” Torey said. The team started the season with 23 new faces and six straight losses. But Torey didn’t push the panic button at that point. Since then, the team has won three games in a row heading into Tuesday’s matchup vs. Harvard and is in a three-way tie for first place in the Northeast Conference. To put more pressure on Torey entering this season, he is the successor of former goalie Kevin Benzing. Benzing ended his career with the Bobcats with 500 career saves and led the team to the Northeast Conference championship last season, when it lost to Mount St. Mary’s. Torey even requested to Fekete to wear Benzing’s number 13 before the season started. All of Torey’s teammates have supported him as he faces an immense amount of pressure this season. Entering the last stretch of the regular season, Torey continues to pursue his level of play heading down the stretch and enjoys the pressure that comes with it.